Enable Net Promoter Score reporting? Note this page provides a setup overview. For specific help, select your 3rd party tool from our integrations page. There are 4 stages to sending an Embedded Thermometer. 3) Generate your HTML embed code. 4) Add your embed code to your 3rd party’s workflow (such as a ticket closure email within a support system). This guide looks at step 1. You can create a single template or as many as you wish for different scenarios. You can also edit an existing Thermometer, by clicking the edit button next to the Thermometer. Select the 3rd party tool from the drop down list that you’re looking to use with Customer Thermometer. Changing this Thermometer type will ensure we provide the correct merge variables for the embed code. Other settings may then appear within the Thermometer set up screen. If the application you’re looking for doesn’t appear within the drop down list, select Basic Links (to create separate tracking links) OR Basic HTML (to create a block of code). Visit the lockout page for details. Give your Thermometer a unique name to refer to later. The report created will also take on this name – so be specific. Note the report name can be edited. This question will appear above the Thermometer icons. Ensure your question is succinct and specific. There’s guidance on getting better response rates, by asking the right questions here. This box will appear if you’ve enabled NPS for your account. When enabled for a specific Thermometer, you will be able to view NPS reporting for any associated Blasts, in your reporting section. Click on an icon set from our library, to include them within your template. Alternatively, you can upload your own. Add an OPTIONAL, short, meaningful description to each temperature rating. Set the text colors by clicking the color pickers. Text in these four boxes will sit underneath Thermometer icons..
By default, temperatures are shown in the order [left to right] Gold, Green, Yellow, Red. There is no right or wrong – it’s a matter of preference. Use this toggle to reverse the order the icons appear within the HTML embed code. Enter the text you’d like to use underneath your Thermometer icons. There is default text available – which explains to the recipient the action they need to take. You can preview what this looks like at any time. 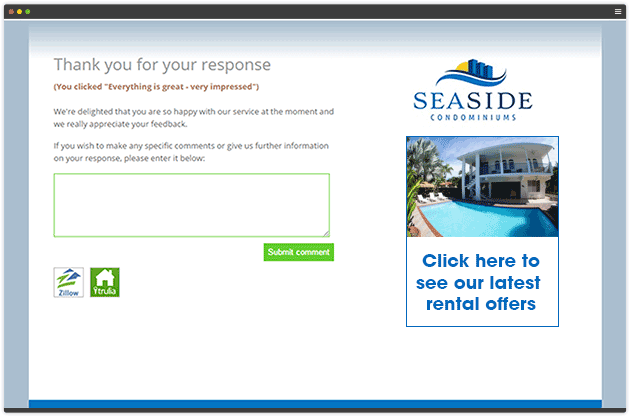 Choose to be notified when a recipient leaves a response or comment. Details here. At any point, you can click the “Generate embed code” button (top or bottom of the screen) to see how your Thermometer is looking. Your template will also be saved too. Your template will popup in a preview box. 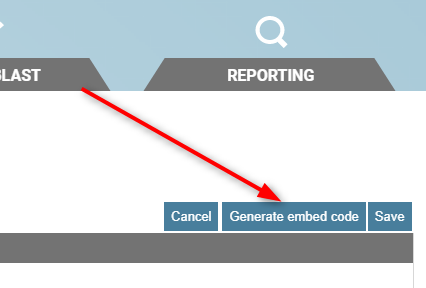 To make changes, close the popup, make your edits and click the “Generate embed code” again. To preview Landing pages – you can do that via the Landing pages tab. Before you embed your code into your 3rd party app, you need to set up your Landing pages – the pages your recipients will see after clicking a response. Once you are happy with your Embedded Thermometer, you will need to edit the merge fields provided and copy the HTML or Links generated and add them to your 3rd party’s email template area. Each integration is different and has its own simple instructions. To find yours, visit our integrations page. Want to watch and listen to an Embedded Thermometer being setup?